The human body is a perfect feat of mechanical engineering. We are a harmony of slings, built for movement. We are not made to sit for long periods of time, and yet we find ourselves doing just that – in our jobs, our cars and travelling on long flights. It’s no wonder our society suffers from chronic back pain, tender hips and stiff, sore necks. We are constantly putting our bodies into unnatural positions for extended periods of time. Add to that weak, untrained core muscles, glute atrophy (glute amnesia) and shallow breathing, it’s a recipe for disaster. 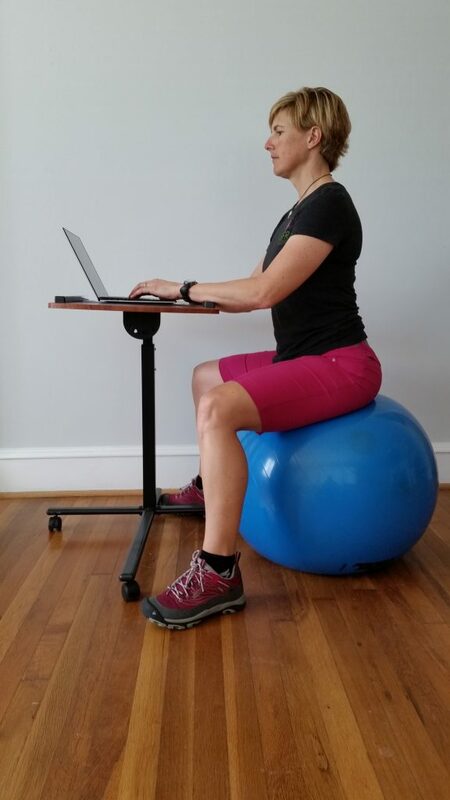 Ditching your regular office chair for a therapy ball is one simple step you can make to better personal health. 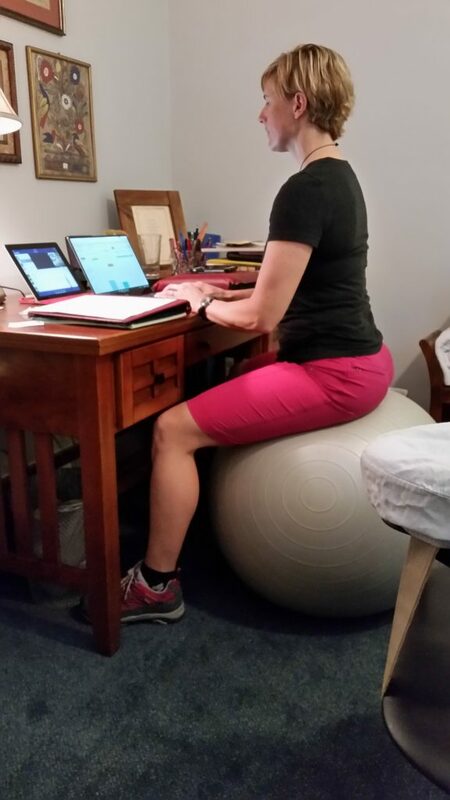 I have long been an advocate for sitting on a therapy ball, and I haven’t sat in an office chair in 10 years. I have also read a few articles where medical professionals have claimed to see no benefit to sitting on a ball. However, the articles fail to state why subjects started sitting on a ball in the first place, or how long they did it before they gave it up as a failed idea. I’ve seen people turn their back pain around by making small changes. 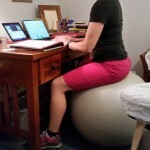 Strengthening their core muscles and stretching are very important, but switching their office chairs for therapy balls has been a key element in their improvements. Now, roll away that chair and sit on a therapy ball. 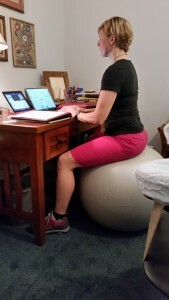 The size of the therapy ball is important, particularly if you are using it at a desk. Ideally, you want your elbows at a 90 degree angle, so you might need to go to a 75cm ball to accommodate elbow angle. You don’t want your shoulders hiked up while you work. Trying to use a ball as a chair for the first time is like breaking in a new pair of shoes. Try it for a little bit, and then when you feel yourself getting tired, switch back to your chair for a while. 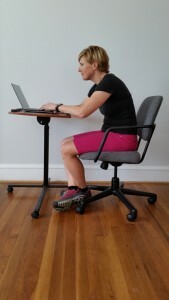 Keep extending the time on the ball a bit more every day, until you can ditch the chair altogether. Within a few short weeks you should begin to notice some changes in your posture. You should experience less back and neck pain and feel more awake because you’re breathing better.